Stingy AT&T customers won’t be the only ones dodging expensive cell phone bills by placing cheap calls with Skype anymore. In an unexpected move that potentially gives customers a way to skirt its own fees, Verizon dropped the iron gate barring Skype from its data network by announcing a partnership with the company on Tuesday. 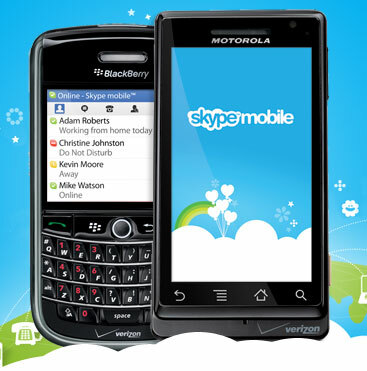 Skype Mobile will allow Verizon customers with smartphones to tap their unlimited data plans for voice calls. While that might seem to make Skype’s $2.95 unlimited Skype Out domestic calling subscription a steal beside the $90 Verizon charges for unlimited domestic calling, there’s a catch. The carrier has already thought ahead and sealed off the door to domestic calling, leaving international calling as the only Skype Out option. Consumers will still be able to make free Skype-to-Skype calls, though. At the moment, Verizon has limited Skype to select Android and BlackBerry phones, including the Motorola Droid, HTC Droid Eris, BlackBerry Curve 8530, Storm 9530, Storm2 9550, and Tour 9630. It will roll out Skype service in March.